Chapter Banquet — Jim Kleeman will be the featured speaker at the chapter banquet March 23 at the Hilton hotel in Gaithersburg.. 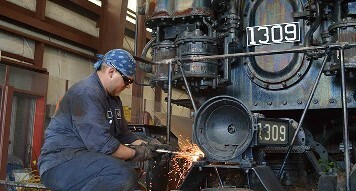 Donate to support the restoration of former C&O 2-6-6-2 steam engine #1309. The chapter will match member contributions dollar for dollar. The deadline is May 31. Western Maryland Scenic Railroad continues to make progress in the return-to-service restoration of #1309. The Baldwin Locomotive Works built #1309 in September 1949 as its last commercially built steam locomotive for use by a railroad in the USA. It had previously been preserved and displayed at the B&O Museum of Baltimore since 1972. Read more. 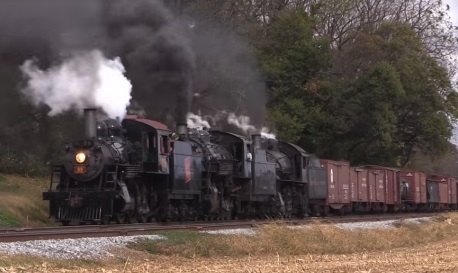 Member Stephen Sery captured a steam tripleheader, featuring engines 89, 90, and 475, during a special photo excursion on the Strasburg Railroad on October 23, 2017. Newsletter — We're very proud of our newsletter, Potomac Rail News. – See last month's issue. – Read the issue from two months ago. – See the issue from three months ago. Meetings — We meet the third Tuesday of every month at 8:00 PM in the Montgomery Country Executive Office Building, 101 Monroe Street, Rockville, MD. We welcome visitors. Get directions. Inclement weather — If it snows on meeting day, we follow the decision of Montgomery County. If the county government closes its offices (not school events), the meeting is cancelled. You can check the county web page for Winter Storm Information. Click on the link for Community Activity/Meeting Cancellations. If the weather looks questionable, the chapter webmaster will update this web page about 6 p.m. on the night of the meeting. Chapter Information — Learn more about our chapter and how to become a member. Parking — There are many parking alternatives for the membership meeting. See a map with alternatives. Photos — See a sample of photos from our chapter. Visiting our area? — As railfans, we can offer sightseeing suggestions for visitors to the Washington, D.C. area. Sample our collective wisdom. Just for Fun: Wayne Sherwin uses his digital editing skills to create some interesting images. Potomac Chapter is a group of railfans based in the National Capital Area. We are chartered as a branch of the National Railway Historical Society (NRHS). We seek to increase public awareness of railroads and their history.